This thread is of our visit to Disney’s Hollywood Studios, in particular our visit to Star Tours: The Adventures Continue. We recorded this memory thread on March 29, 2015, which was our second day at Walt Disney World. We arrived at Hollywood Studios a little after the park opened that day, crowds were relatively low at that time. After entering the park, we started making our way towards Star Tours, taking our time and getting used to seeing Hollywood Studios without the giant Sorcerer’s Hat that had been there every other time we had visited. It is a big difference. We had a fastpass for Star Tours, but its scheduled time was about 20 minutes away. So, we decided to see if we could do a walk-on ride of Star Tours first. We got there and the wait was about 10 minutes, which pretty much means you can just walk onto the attraction. We made our way through the queue and had our adventure in the Star Wars universe. By the time we got done, it was time for our fastpass. We exited the attraction, weaved our way through the obligatory gift shop and went right back into the queue with our fastpass. Once again, it was a walk on. This time, after we got done, we decided to see if we could walk on again, which would tie our record of three times in a row on the same day for Star Tours, which we accomplished last year. As some of you may know, being able to ride Star Tours 3 times in one day, let alone 3 consecutive times, is usually a hard thing to do on most normal days in the park as Star Tours is a very popular attraction. So we were psyched to see if we could do it again, and low and behold, we were! So, after tying our record, the family decided that it was time we went to do something else in Hollywood Studios. Truth be told, I could have gone a fourth time! As we walked out of the gift shop and past the entrance to the queue, the wait time was still very low and we could have walked on again and broken our record. Maybe next year! 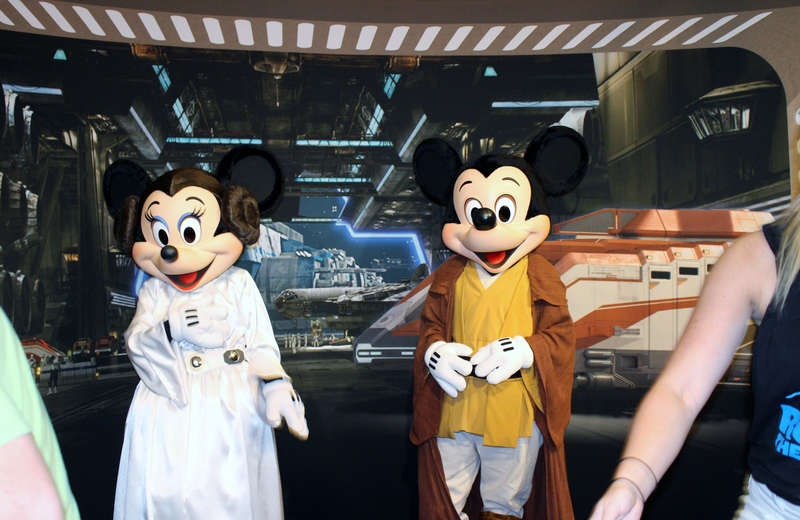 Star Tours—The Adventures Continue is a 3D motion simulator attraction located at Disney’s Hollywood Studios, with similar installations at Disneyland, and Tokyo Disneyland and one opening soon at Disneyland Paris. Set in the fictional Star Wars universe, Star Tours takes guests on a turbulent excursion across the galaxy, as droids C-3PO and R2-D2 attempt to safely return a rebel spy to the Rebel Alliance. This iteration of Star Tours takes place between Episode III: Revenge of the Sith and Episode IV: A New Hope, unlike its predecessor, which took place after the events of Episode VI: Return of the Jedi. The attraction at Disney’s Hollywood Studios opened on May 20, 2011. Similar to the functionality of the previous attraction, Star Tours—The Adventures Continue places guests in the role of space tourists en route to a predetermined destination. The queue is designed to resemble a spaceport terminal: posters advertise voyages to different planets, and a large LCD screen informs riders of the benefits of booking flights with Star Tours. The queue is populated with Audio-Animatronic characters, including C-3PO, and R2-D2, that interact with one another. Two G2 droids interact with guests as they conduct their tasks. The more outspoken droid processing the passengers’ luggage on a scanning system reveals the luggages’ contents to the guests waiting in the queue. Many references, gags, and in-jokes are made via the contents of this luggage. Guests then retrieve their 3-D “flight glasses” and are directed by a flight agent to one of several concourses where they wait to board. The ride sequence is randomized, with a branching narrative. This gives Star Tours the advantage of being both highly repeatable and constantly surprising. Even though guests can experience 54 different journeys, the main priority of delivering the Rebel spy to safety, is accomplished no matter what the sequence is. The Rebel spy’s identity is chosen by the cast member operating the ride vehicle from among the guests on the attraction, and their picture is presented during the ride. When referring to the spy, characters will alter their dialogue depending on the gender of the person chosen as the spy (him, her, or them). Sometimes, no guest is chosen as the Rebel spy, and a generic photo is used. There are eleven random segments of the film: two opening segments, three primary destination segments, three hologram message segments, and three ending destination segments. When combined, they allow 54 different possible ride experiences. After exiting the ride vehicle, guests are shuffled through the space terminal and into the attraction’s gift shop. The Florida version is called Tatooine Traders and is inspired by a desert outpost in Mos Espa. I hope you enjoyed three consecutive rides on Star Tours! We sure did. If you like this podcast, could you do me a few favors? Please like us on Facebook, we’re at facebook.com slash wdwpensieve, and subscribe to the podcast on podomatic, iTunes, Stitcher or YouTube. If you’d like to contribute to the podcast, there’s a PayPal donation link on our podomatic page. Any funds donated would go to the purchase of better audio equipment to produce this podcast and record the memories. I’ve only processed two and a half days of our last trip and already have 30 memory threads ready to go. I’ll have even more once I process the other two and a half days, so chances are, I have a memory thread of what you want to hear. Just drop us a line! Also, I’m being sent to Tampa in just 9 days for work and my wife will be going with me this time. We’re taking this opportunity to have a delayed 15th anniversary trip with just us, no kids. And we’ll be visiting the Magic Kingdom for about 10 hours while we’re there, recording binaural audio the whole time, so I’ll have even more memory threads for the pensieve. Let me know soon of anything you’d like me to capture while we’re there! So, that will do it for memory thread number five in the WDW Pensieve. Once again, I appreciate you sharing our memories with us.